Education reporter Neal Morton explains how the state Legislature made contract disputes inevitable by raising property taxes in a funding scheme that did not treat all districts equally. Leading up to Labor Day, two dozen public-school districts across Washington state were dealing with threatened or active teacher strikes. As many as 240,000 students stood to be affected, with classes just about to begin. Deals were subsequently reached in many districts, but teachers-union strikes have been ongoing in others, including Tacoma’s. In Episode 90 of The Overcast, the Seattle Times news and politics podcast, Times education reporter Neal Morton schools host Daniel Beekman on the chaos. The seeds for the contract battles were planted last year, when Democrats and Republicans in the state Legislature, after years of debate, agreed on a plan to vastly boost money for Washington’s public schools by raising property taxes. The move meant more money for teacher wages, but the lawmakers didn’t finish the job until this March, the state Supreme Court didn’t sign off until June and the plan treated each district differently. So, districts and teachers had a lot to talk about and not much time. 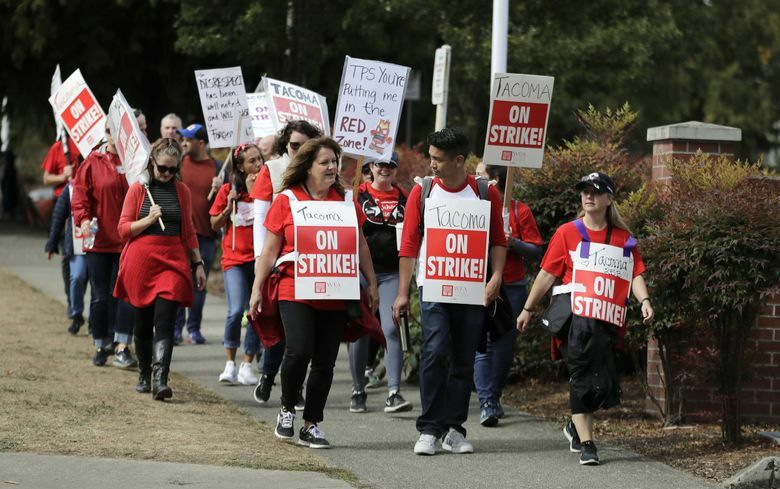 Morton zooms in Tacoma, where some staff members returned to work Thursday while others held a rally to boost their strike. The district and the union there announced a tentative pact Thursday night, after this episode was recorded. He also recaps what happened in Seattle, where teachers won an across-the-board pay hike of 10.5 percent and five days of paid parental leave. Finally, Morton looks ahead. In Seattle, both district and union officials have said they believe the Legislature must allocate even more money to make sure the new contract is sustainable. This podcast was recorded at the Seattle studios of public radio 88.5 FM KNKX.